Good morning! New Meal Prep Monday here for you today! Up and at 'em! 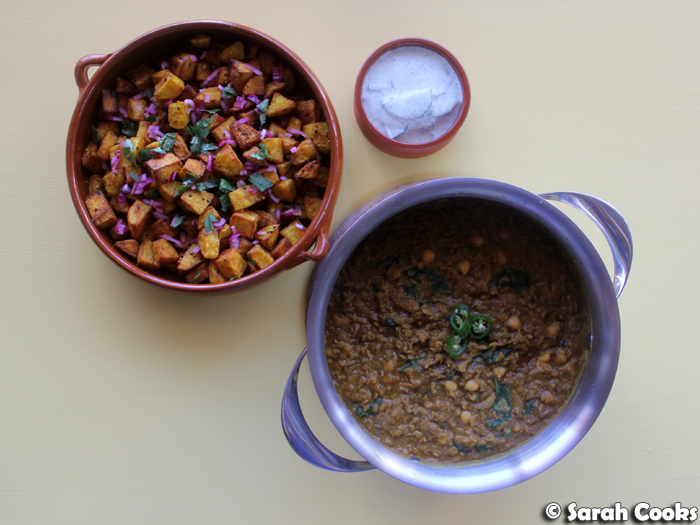 Today I've got a super flavourful Indian-inspired meal: red lentil and chickpea dhal, with Indian roast potatoes and cucumber raita. This was my lunch for the first week back at work this year, but since then it's gotten seriously hot in Melbourne, and I've been waiting for the weather to cool down to post it! I loved the idea of starting the year with a protein and fibre-packed vegetarian meal, but I was also seriously craving some spice and bold flavours. You see, Sandra's parents were visiting over Christmas, and we were travelling together, so we were eating a bit differently from usual. Sandra's mum, in particular, can't tolerate any type of hot or spicy food, and there are many spices she doesn't like, so Indian food (and other cuisines I love, like Sichuan and Mexican), were definitely off the table! So when it came time to make this meal prep, I had a quick flick on Pinterest for some Indian recipes, and because I had a kilo of potatoes sitting in the fridge, I thought I'd have a go at Nigella's Indian-spiced roast potatoes (from Kitchen). Our pantry is well stocked with spices and pulses (Sandra went through an Indian-vegetarian phase last year), so there was barely any shopping involved. Woop woop. Let's start with the potatoes! 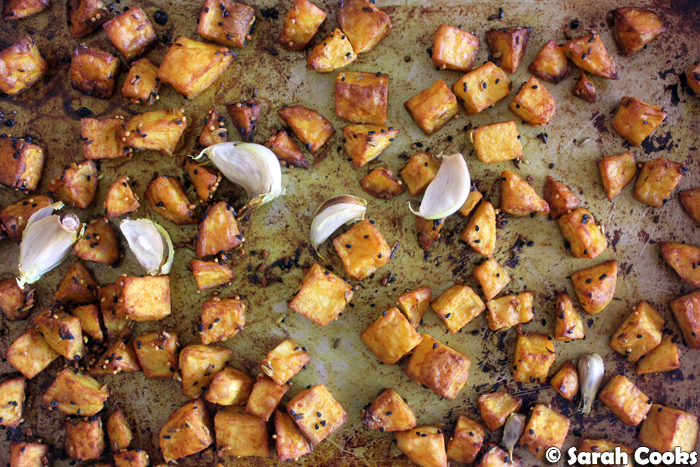 These Indian roast potatoes are essentially an oven-roasted version of panchporan aloo, or potatoes in whole spices. (A recipe for panchporan aloo also appears in How to Eat). 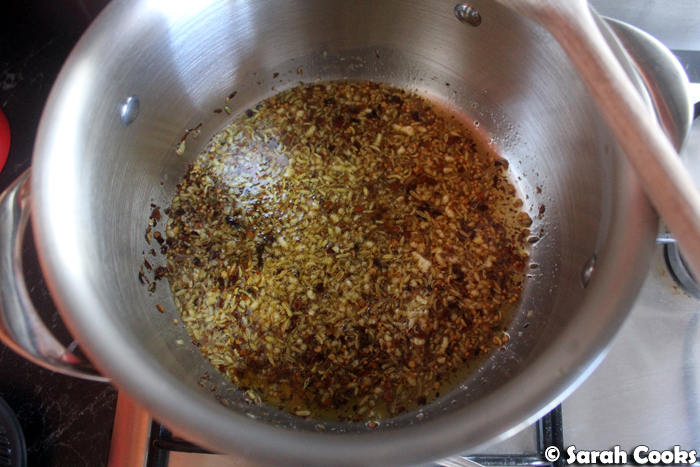 The spice mix is pretty much the same in both versions (How to Eat uses fenugreek; Kitchen uses fennel; I used both). Spice up your life! Look at all those beautiful spices. And they're not just there for a pretty picture - measuring out all the spices first makes the whole process a lot simpler. ... chuck some garlic cloves in the tray, and then roast until crisp. Ta-dah! I believe panchporan aloo is traditionally cooked on the stove (and I did make it that way during my How to Eat Project), but the oven is so much easier, especially because you can cook other things while the potatoes are in the oven! 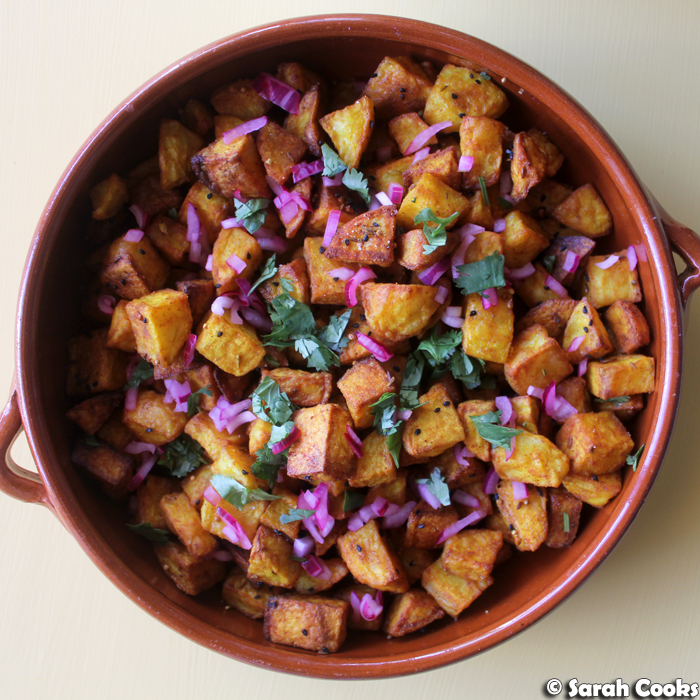 Nigella adds some lime-steeped red onion and fresh coriander to her Indian roast potatoes, and I love the pop of colour and the fresh flavour. 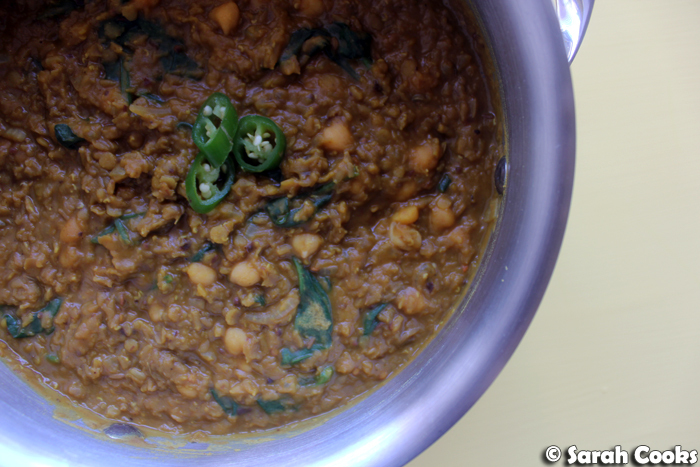 So, dhal. I found a recipe for red lentil dhal on Indian Delights (via Pinterest), which looked like a pretty good basic dhal recipe. I made some small adjustments to the ingredients based on what I had, and also added some chickpeas and spinach leaves at the end. (Bonus protein! Bonus texture! Bonus green vegetable!) As per my previous advice, it makes things a lot simpler if you prepare and measure out all the ingredients before you start cooking. I gotta say, the sizzling spices and garlic smell SO good! It reminded me of that spice mix they use in Sichuan cookery, that you might find sprinkled over fried lamb ribs. (Ungggggh so good). From here you basically chuck all the other ingredients in and simmer slowly until cooked. I don't normally order raita at restaurants, but I did think something fresh and light would be nice against the dhal and potatoes. For this, you simply whizz together some yogurt with green chilli, mint and coriander, and then stir through some cucumber. I cut the cucumber into half-moons, but I think in future I'd prefer a more uniform texture, so would probably grate or finely dice the cucumber. Either way, it tasted great and complimented the curry and potatoes well. And that's it! I really enjoyed this meal, with all the great spices and complex flavours. I was looking forward to it every day, even though I ended up eating it for six meals over one week. I misjudged how much those red lentils expand when you cook them, and made a much bigger batch of dhal than expected! Apart from all the dhal I ate myself, I gave a couple of individual servings to friends, and even froze an individual portion for a future speedy supper. However, I have adjusted the amounts for the recipes below - the recipe will make approximately four generous servings, so a week of meal preps. Enjoy! 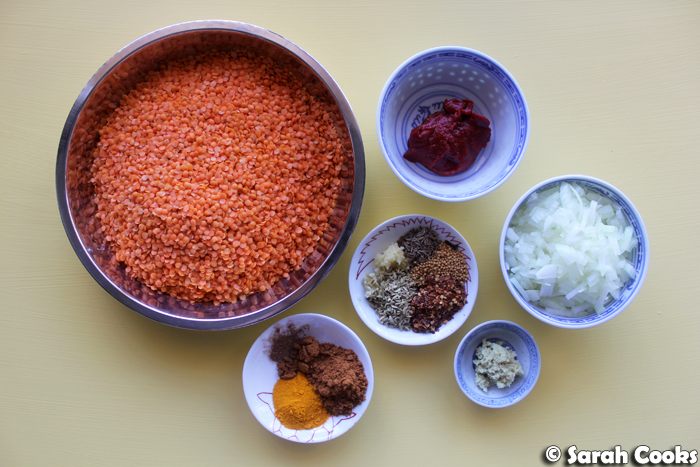 Place the garlic, fennel seeds, cumin seeds, yellow mustard seeds, chilli flakes, and clove in a small bowl and set aside. 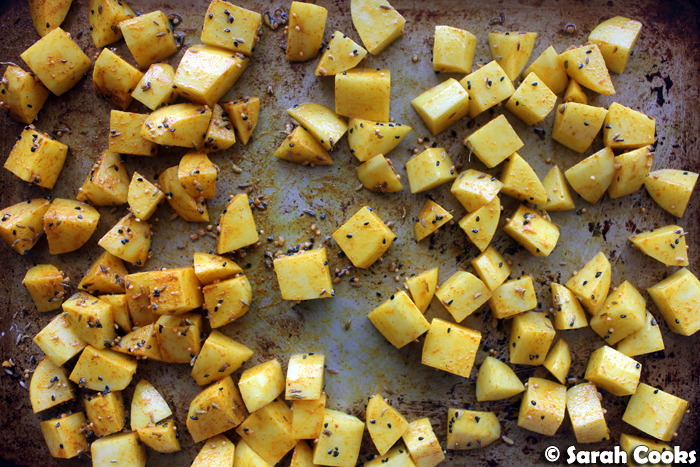 Mix together the garam masala powder, turmeric powder, and nutmeg in a small bowl and set aside. Heat the vegetable oil in a large pot. Once hot, add the garlic and whole spices, and stir fry until fragrant, approx. 1 minute. (Be careful not to let the garlic burn). Add the chopped onion and stir well, cooking until the onion is softened and translucent. Add the red lentils and stir to coat in the fragrant oil mixture. Add 2.5 cups (625 millilitres) of hot water from a recently boiled kettle, followed by the grated ginger, tomato paste, and dry powdered spices. Stir well and bring to a gentle simmer. Cook for 20 minutes, stirring occasionally to make sure the mixture doesn't stick to the pan. Add more hot water if the mixture gets too thick. Add the chickpeas and baby spinach leaves, and stir in until the spinach is wilted. Garnish with chopped coriander to serve. Preheat the oven to 200C. Peel the potatoes and chop into 2-3 cm dice. Place the potato pieces on a large shallow baking tray in a single layer (I used two baking trays), and drizzle with the oil. 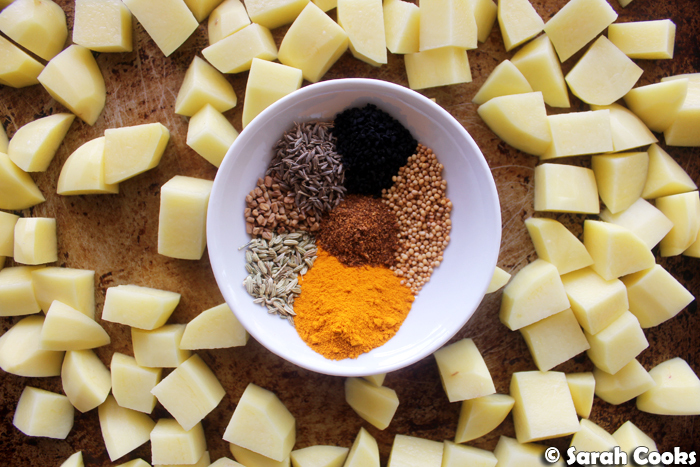 Mix together all the seeds and spices, then sprinkle over the potatoes and toss to coat evenly. Break up the garlic clove and add to the tray. Bake for 1 hour without tossing the potatoes. (If you are using two baking trays, swap the baking trays halfway through cooking). Meanwhile, place the finely diced red onion and lime juice in a small bowl, cover with clingwrap and set aside. Once the potatoes are cooked, transfer to a serving dish or your meal prep containers. (I remove the garlic and discard, but feel free to keep them in if you love garlic and aren't afraid of garlic breath). Season generously with salt. Garnish with the red onions (discard any excess lime juice) and chopped coriander. Place the chilli, mint leaves, coriander leaves and yogurt in a blender and mix until combined. Trim the ends off the cucumber, cut in half lengthwise and then cut into fine half moons. (Alternatively, grate the cucumber if you prefer a more uniform texture). Stir the yogurt mixture and the cucumber together. Season with salt to taste.